Free Hot Water’s engineering services include designing, manufacturing, and assembling crucial solar thermal components, such as pump stations, heat exchangers, and manifolds. For quick prototyping, we use our own tool set, including 4 axis CNC mills, manual lathes, grinders, and polishers. Because we offer design and prototyping, we can integrate our solutions into projects in record time. 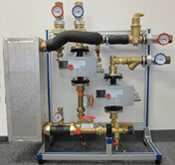 In addition, Free Hot Water designs and manufactures manifolds for heat exchangers and solar water heating tanks. Free Hot Water engineering and mechanical services are brand neutral. Our engineers have worked with leading solar water heating manufacturers and contractors from around the globe. Contact us to learn how Free Hot Water can design and manufacture solar thermal components for your company.